Many use the term ‘freelancer’ and ‘entrepreneur’ interchangeably, however for true success it’s important to know which you really are. But what is the difference? You started your own company and you became your own boss. You focus on growing your business, putting in place the processes that will help you scale, and even delegating tasks that don’t require your expert attention. But does this make you an entrepreneur? Many use the terms ‘freelancer’ and ‘entrepreneur’ interchangeably. While they may have similarities, it’s absolutely necessary that you know which you really are, to ensure you’ve got the right strategies in place for growing your business. Seth Godin put it simply by defining a freelancer as someone who gets paid for the work they produce, either by the hour or by the project. Freelancers are those whose specialization is in providing services to others. They could be writers, designers, photographers, or anybody with a particular skill set that others can hire them for. On the other hand, Godin defines an entrepreneur as a person who aims to use money (preferably someone else’s) to build a business bigger than themselves. “Entrepreneurs make money when they sleep. Entrepreneurs focus on growth and on scaling the systems that they build,” Godin writes. Still not sure? Consider the following. A subtle, yet simple way to determine if you’re an entrepreneur or a freelancer is to assess what you’re good at and where you spend most of your work time. Freelancers major in practical skills. They spend the majority of their time being ‘hands on’ in projects. Freelancers can secure a regular income flow, as long as they can find ongoing or regular gigs and work with clients who won’t rip them off. Entrepreneurs, on the flip side, are driven by ideas. They are motivated by the desire to solve a societal deficiency or bridge a market gap through a disruptive new product or service. Unlike a freelancer, entrepreneurs often manage others to get the work done. They own the idea and have people play out specific roles based on how good a fit they are for the job. Where a freelancer works directly for payment, an entrepreneur does it to further their brand. How should you scale your business? So why does this distinction matter? Because it goes a long way to determining how your scaling and expansion should go. For freelancers, the goal is simple enough: have regular work and regular (or growing) flow of income. When you talk about scaling your business as a freelancer, you always need to look to either time or prices. To make more money, you can work more hours on client work, or increase your rates. This means your main aim is to increase demand in order to scale. With higher demand, you can fill all of your available work hours or demand more money for your work. You can scale to a certain degree by automating some parts of your role (for example, looking for new clients or invoicing), gaining efficiencies that allow you to spend more time on money-making activities. But once you’ve reached capacity in terms of your time, your only other option for growing your business is to increase your prices. Most freelancers are working in a highly saturated market, and this means that one of the best ways you can increase demand is to differentiate yourself. Improve your skills and customise your services so you can attract higher value clients. Define a distinct niche that you work in, so that you can become the ‘go-to’, most sought-after freelancer in a particular topic area, within a particular industry (for example, a writer who specialises in articles about ‘automation in the healthcare industry’). For freelancers, hiring other workers with similar skills would disturb the flow of income. Such a model is for the entrepreneur, not the freelancer. For entrepreneurs, the business goal is to build a sustainable business that won’t die with you. In order to scale this, rather than customising your services as much you can, you should do the opposite. Your job is to standardise and scale as fast as possible. You want all of your customers to have a consistent, extraordinary experience with whatever you’re selling and to be easily able to share their experience with others so that they’ll want to purchase too. 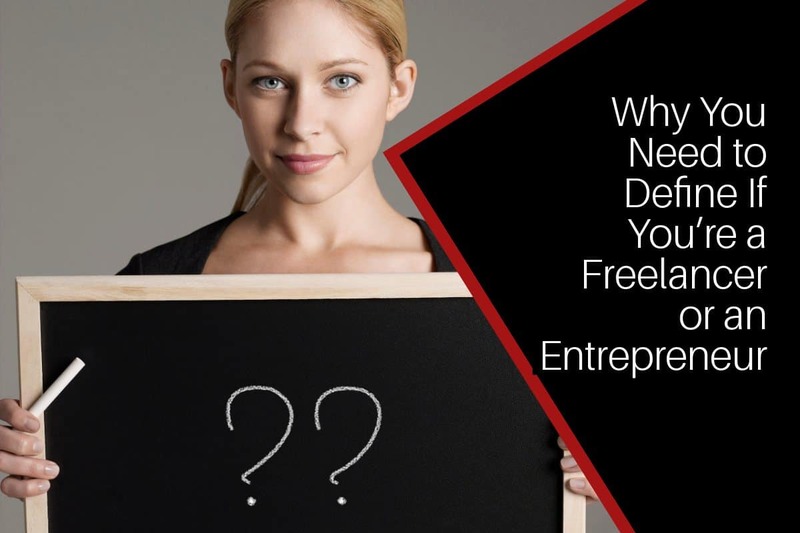 As a freelancer, you need to position yourself as harder to obtain so that people will pay a premium to have access to you; as an entrepreneur, you want to make it simple for people to access your product or service. You want to ensure extremely consistent and fast delivery, so that your business will become shareable and therefore scale much more quickly. Whether you’re a freelancer or an entrepreneur, you can have a healthy business and a thoroughly enjoyable work life. Many freelancers are entrepreneurial in spirit, and they don’t like to hear that they aren’t strictly an ‘entrepreneur’. But it’s important to know that there’s not one business model that’s ‘better’. Both are valid ways of making a living and finding fulfilment. It’s about where your goals lie and what you hope to achieve with your business. If you want to creatively explore your skills in delivering excellent services to people and get paid for it, you are more inclined to be a freelancer. But if you want to disrupt a market, take risks, and build a sustainable business that lives on beyond you, entrepreneurship is a better fit for you. So, freelancer vs entrepreneur? Being familiar with the difference between the two roles early on simply helps you to focus on the right things when it comes to time to scale your business. To join a tribe of supportive women, freelancers and entrepreneurs, become part of the Empowering Ambitious Women community. Stay in touch on our dedicated website, Facebook and Instagram accounts. Sophie is a content marketer and growth strategist. After working in a digital consultancy in Sydney for many years, she packed her bags and converted to the life of a digital nomad. She now works as a growth marketer for AND CO from Fiverr while traveling the world. She writes about freelancing, remote work, and growing a business through digital marketing.